Shop Our Wide Selection Of Diamond Wedding bands on Gold Or Platinum! Shop our breath taking diamond eaarings, stud earrings, hoop diamonds earrings, and so much more. If we don't have what you need we will make it for you free of charge of the design. Diamond Bracelets... We carry some of the biggest diamond bracelet in the market up to 55 carats. Shop our hand picked selection , remember if you don't see what you are looking for just contact us and we will make it for you best prices guaranteed. 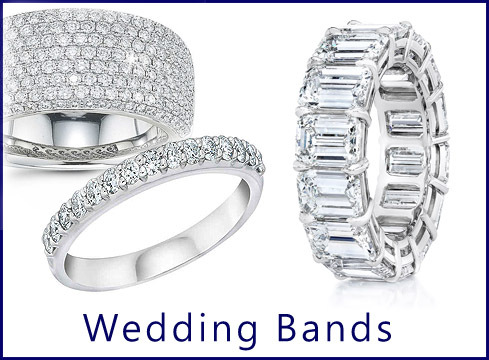 Shop our wide variety of wedding bands with or without diamonds.... We guarantee the best price! Brown our vast inventor of our beath taking diamond neckales... If you see it anywhere else cheaper we will beat it. Best prices guaranteed! You Dream it... We Can Make it Contact Us for one on one session.